Saturday action at the first ever Western Regional Blind Hockey tournament at the Langley Sportsplex. The first-ever Western Regional Blind Ice Hockey Tournament is underway at the Langley Sportsplex this weekend. Teams were assembled with players from various communities, so they did not have team names, an organizer explained. 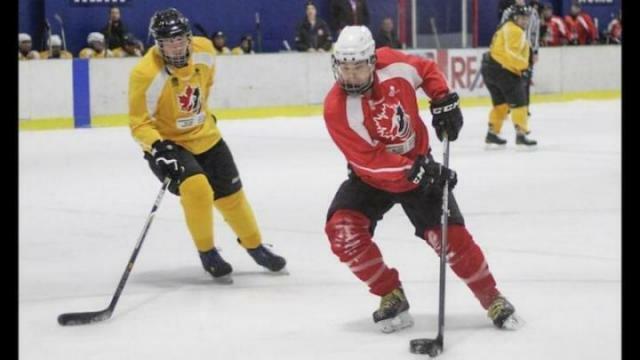 “It’s for bragging rights,” said Nick Beatty of the International Blind Ice Hockey Federation. The first match on Saturday at 12:15 p.m. pitted the red and yellow teams against each other. Red won 8-7. Games were scheduled for 5:30 and 7 p.m. Saturday and Sunday from 10:15 to 11:45 a.m. The sport is played by athletes whose level of vision ranges from legally blind (10 per cent vision or less) to completely blind.